"They are but beggars that can count their worth" -- William Shakespeare in "Romeo and Juliet"
Whenever poorly-clad, dirty and expectant people gathering along major road junctions, bus stands, temples, mosques or churches, rail stations, etc. pleading for a coin or two are seen, they are either abused or evaded, or some coins are thrust into their empty bowls helplessly. Little do people looking at these beggars realise that they too are human beings with self-respect and desire for a better life. Very few care for their psychic state and reasons for their helplessness and stark poverty. As per the government data, there are about 3.7 lakh beggars in the country. Of these around 25% are Muslims. The data was based on religious orientation of those considered 'non-workers' in the Census 2011. The population of Muslims is about 14.23% of India's total but the number of beggars is comparatively high. As per the census 2011, 'non workers' are people who are non-participants in any economic activity ( paid or unpaid) , household duties or cultivation. The Census categorised 72.89 crore individuals as non-workers, and of these 3.7 lakh as beggars. The census listed 92,760 Muslims as beggars. Hindus, who make up 79.8% of total population, had 2.68 lakh individuals listed as beggars (72.22% of Indian total beggar population). In a written reply to the Rajya Sabha, the Minister of Social Justice said that there were 4,13,670 beggars -- 2.2 lakh male and 1.91 lakh female beggars. West Bengal, Assam and Manipur had more female beggar than males. Thus, there are sizeable number of people who have almost no option but begging. The problem of begging is associated with the problem of poverty and unemployment and it is a social problem of great magnitude as well as concern. 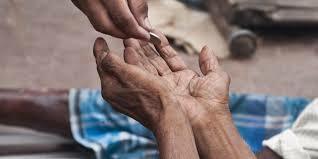 According to a survey of Delhi School of Social Work, there has been a phenomenal increase in beggars in India. In a decade since 1991, their number has gone up by a lakh. There were around 60, 000 beggars in Delhi, over 3,00,000 beggars in Mumbai, according to a 2004 Action Aid report. Then, there were nearly 75,000 beggars in Kolkata, according to the Beggar Research Institute, and in Hyderabad, one in 354 is engaged in begging, according to the Council of Human Welfare. Indeed, the line separating beggars and casual poor is getting slimmer, when one in four goes to bed hungry every night. Although many think that beggars are very happy and do not face problems, studies reveal that they face a number of difficulties in their lives. A study published in the "International Journal of Rehabilitation" by Dr Yogesh Thakker states that 39% of the beggars, surveyed in Gujarat's Vadodara district by a group of medicos, suffer from one or the other psychiatric illness. Nearly 74% of them had a history of addiction, psychiatric illness in the family and poor attitude of family members towards them. Over 68% admitted to shame and losing self- esteem, 25% to guilt, 4% to suicidal tendencies and 8% to anti-social activities. There appears to be no proper enumeration of beggars in the country. Number of women and children beggars is rising. The 1931 census showed 16% women as beggars, which shot up to 49% in 2001. There about 10 million street children, many of whom beg for livelihood. A recent research paper in its analysis of primary data collected in Utter Pradesh's Aligarh district listed causes of begging and suggested some solutions. The research revealed major causes of begging are prevalence of poverty, illiteracy, by inheritance of caste, handicapped, diseases, old age and death of parents, etc. Of these poverty was the most common causes found in half of the study population in the area. The study has clearly demonstrated that this section of people are the poorest of poor and their foremost aim is the most basic need -- food. Other necessities (shelter and clothing) are far away and new additive needs like health and education are a dream for them. Many state governments have 'banned' begging and the act of begging is seen as an undesirable unlawful act. Even the Centre is apathetic to the problem. Instead of taking positive steps towards rehabilitation and social reforms, prohibiting beggary may not yield results. " It demands a meaningful resolution. anti - begging laws is more a punitive action than remedial in nature. It needs to be tackled with by governmental and non-governmental organizations. The root of the problem should be analysed so as to arrive at appropriate solutions. Laws are not the solution to a perennial problem of grim poverty and destitution. In Indian society, especially Hindu castes, beggars belonging to a Brahminical caste are treated differently to those from Dalit and other lower caste. While 'yachakas' (Brahmins seeking alms) are given food and money to attain virtue (punya), Dalits are often abused and sent away most of the times. This discrimination should also be addressed and such evil must be stopped. As Dalits and lower castes comprise more than those belonging to upper castes, there is a need to address the problem from the caste point of view. Annihilation of caste should go hand-in-hand with upliftment of beggars in the society. Caste is the prize, and earns value proportionate to the position it occurs in the hierarchy of one's birth in it. Our chief secretary, a Tamil Brahman, had all his peons of his own caste of the state where he was working. He never called them by name [A, B, or C] but as Pandey Ji, DubeJi, Sharma Ji, etc. [surnames of his own community, not class in north India] with proportionate amount of emotion and respect, which would not mark his attitude towards others personnel of similar station. So, other too would do likewise, else they ran the risk of displeasure of the class of employees. Dr B R Ambedkar said unambiguously "look at any drection and caste is the monster. The irony of a brahmin begging for alms is that he demands as opposed to pleading for alms. He also flaunts his caste as a badge of honour when making the demand for charity.